Squirt '08 goalie competes at November 27th Vegas Knights game! 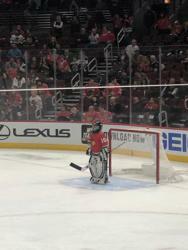 Liam Lucey, goalie for the Stallions 2008 Squirt team, competed on Tuesday November 27th at the Beko 1-on-1 challenge during the Blackhawks vs. Knights game. 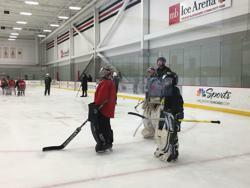 While Liam did not win the challenge, he represented the Stallions well on the Blackhawks home ice. Congratulations Liam! Liam Lucey gets ready to battle! On Saturday, the Stallions had nine Squirts participate in the BEKO 1-on-1 Breakaway Challenge at MB Ice Arena. The top two goalies and top two skaters from the competition will be battling for the championship in front of a sellout crowd at the United Center during the intermission of the Chicago Blackhawks home game on November 27, 2018! Stallions are proud to announce that Squirt 2008 Goalie Liam Lucey was one of the 2 goalies chosen to participate in the November 27, 2018 challenge! Liam will be participating along with a CYA goalie, CYA player and a TI player. Congratulations Liam! Additionally, Max Beemsterboer on the Squirt 2009 team was one of the final three shooters on Saturday, losing to the eventual qualifier by only one goal! Our own Cathy Bergmann spoke to Liam after the competition and asked him what it was like to be in the final round. Always cool as a cucumber Liam told Mrs. Bergmann, "There were six shooters left and each got 3 shots, the other goalie let up 9 and I only let up 2." What was the best part of Liam's day? "It was nice having my teammates cheering me on." Congratulations to all our Stallions, and best of luck Liam!